I often work in glass and metal, and combine different materials into unique art jewelry. I always have my hands in natural materials, spending much of my time outdoors collecting shells, seeds, wood, beach glass and stones while observing nature. I work both small, inviting the observer to hold and touch an unusual glass bead treasure, and at times large and architecturally. I was born in California, USA. After a degree in commercial art from Colorado Mountain College, I worked in an architectural stained glass studio near Aspen, Colorado. Later I studied all forms of glassmaking at Pilchuck Glass School in Washington State. I also studied mosaic, glass painting and metal sculpture at the University of Hawaii and glass sculpture and painting at Kent State University. I’ve worked on several community art projects including Kamalani Playground, Pavilion and Bridge on Kauai, Hawaii, where I helped design and build mosaic and concrete benches, caves with glass windows and other structures. 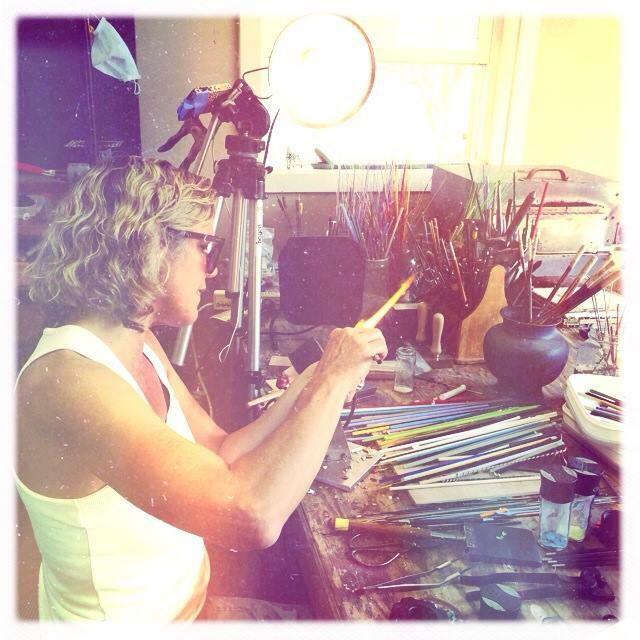 I later founded a non-profit arts and recycling glass studio where I taught hot glass casting and we made recycled glass art products as part of an economic development project for the County of Kauai, demonstrating closed loop recycling. I also built a large concrete and mosaic wave/bench sculpture at Hanalei School on Kauai as part of the 1% for the Arts in Hawaii. My artwork is also in the collection of the Hawaii State Foundation on Culture and the Arts. ​In 2015, my kiwi husband and I settled into the NZ far north.